Kenneth “Red” Hummell, 88, of Mt. 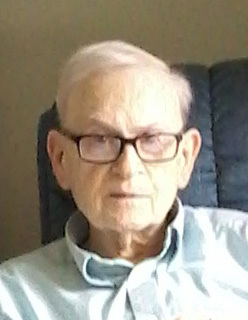 Pleasant, IA, passed away Thursday, October 11, 2018, at Savannah Heights. Born April 22, 1930, in Peoria, IL, Kenneth Owen was the son of Owen M. and Frances L. (Schirmer) Hummell. He was a 1950 graduate of Mt. Pleasant High School, where he excelled in athletics and was named to the All State Football Team in 1947. On December 28, 1968, he married Connie Bain at the First Baptist Church in Mt. Pleasant. “Red” served in the Iowa National Guard from 1948 – 1958. He was employed by the A.D. Hayes Company and Watkins Feed and Farm Supply. Later he began a 23 years career with Northern Propane. His last seven working years were spent as a custodian for the Mt. Pleasant School District, from which he retired in 1992. Red was an active member of the First Baptist Church in Mt. Pleasant. He was a long-time bowler and avid sports enthusiast, cheering on his Chicago Bears, Chicago Cubs and the Iowa Hawkeyes. In addition to his wife, Connie of Mt. Pleasant, IA, Red is survived by a daughter-in-law, Melissa Hummell Sprague of Mt. Pleasant, IA; three granddaughters, Nikole, Hallie and Kelsey Hummell; one grandson, Jakob Sprague; and one great granddaughter, Aubree Francy. Also surviving are two brothers, Henry (Mary Lou) Hummell of Orange, CA, and Robert (Suzanne Ales) Hummell of Santa Ana, CA; and two sisters, Mary Koble of Mt. Pleasant, IA, and Frances (Tom) Martin of Fountain Valley, CA. Red was preceded in death by his parents; two sons, Corey Hummell and Gregory Hummell; one sister, Leola Prottsman; and one brother, Keith Hummell.